Yesterday, one of our post 16 learners was privileged to be offered the chance to visit Bedfordshire Police HQ, in Kempston to find out more about the role of a police dog handler. Alex* is almost 18 years old, profoundly deaf and living in care. He attends The Seeds of Change Post 16 programme, which focuses on exploring young people’s employment options and supporting the often tricky transition from education to employment. During a conversation with Sam, his coach, Alex discussed ‘dream jobs’ and Alex shared that he loved watching police dog handlers and was fascinated by the obedience of the dogs. This conversation led to yesterday’s visit, where he was invited to shadow the Bedfordshire Police Dog Handling Unit during one of their training sessions, accompanied by his coach. They were met at the police station by Sgt Andy Greenacre who is head of the Hertfordshire, Bedfordshire and Cambridgeshire Police Dog Handling Units. Sgt Greenacre was on hand throughout the day to answer Alex’s many questions and to explain the processes the dogs and their handlers were demonstrating. Alex met four police dog handlers and their eight dogs; each handler had one General Purpose Dog and one Specialist Search Dog. All General Purpose Dogs are trained to track for persons/offenders, search open areas and buildings, to hunt for and find recently discarded items of property and also to detain suspects. The Specialist Search Dogs are trained to detect firearms and ammunition and cash, drug and media related items. Alex learnt that the dogs are assigned to their handler and remain and live with their handler for the duration of their working life. On retirement from duties, the majority stay on with their handler as a pet. Sgt Greenacre and his team explained that the police force now use rescue dogs and retrain them. Alex asked if these dogs were ‘not as good’ as the dogs that were bred for police usage: Sgt Greenacre explained that after following the training programme, the end result was much the same. Alex identified correlations with his own life, as a young person in care; just because someone’s early life does not follow convention or a desirable path, it does not mean that with the right support, care, training and education that their long-term outcome and achievements needed to be overshadowed by their start. Much like many of our learners, the police officers had allowed the dogs the opportunity to rewrite their life story. 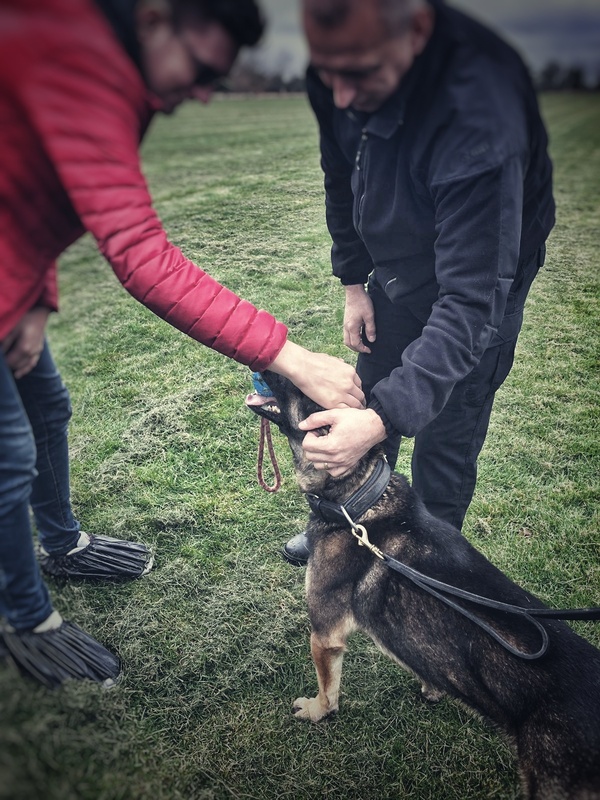 They observed the dogs and their handlers run through a number of training exercises including a property search and agility and obedience tests. Alex was in awe of the speed, nimbleness and velocity of the dogs, whilst also recognising how intimidating and effective their perceived power and determination could be. Additionally, he was amazed by the dogs’ flexible mental capacity to switch between duty and off duty mode, something most working adults can have difficulty doing. It was evident how passionate and dedicated both dogs and handlers are about their work and partnerships, and the invaluable role they play within the police force. The day was beneficial on many levels: building a new perspective of the police force and a newfound respect for the work they do and the level of skill and dedication required; understanding the potential work opportunities that exist in the emergency services for people with hearing impairments; and educating one young person about the true repercussions of committing crimes. Thank you to the Bedfordshire Dog Handling Team for allowing us the opportunity to experience and learn about this line of work.